Like college students across the country, many Spiders battle stress, anxiety, depression, and other mental health challenges — which is why Richmond makes it a priority to support the total wellness of a student. We’re proud that our own students recognize that, too, and that they are taking action. 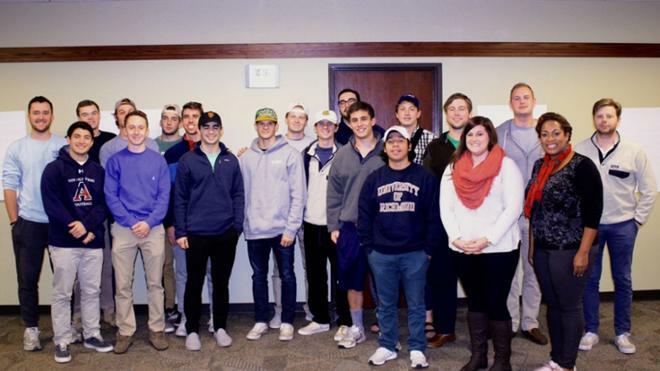 A group of Richmond fraternity members have joined together to support one another by creating a UR chapter of the national Mental Health First Aid program. Interfraternity Council president Dave Fishman, ’18, told The Collegian that after he was elected, he reflected on the needs he saw within his community, recognizing that mental health still carries a stigma and can be difficult to discuss. He wanted to offer a new type of mental health program that could train men within the fraternity community to be a type of first responder. The program trains students to be points of reference within fraternities on campus, offering a supplement to the strong existing wellness support at Richmond, like CAPS and health and wellness education. We’ve always known that Spiders take care of one another, and this is just one more powerful example.